← How Perceptive Are You? How Do You Cook Up Suspense? Here’s a Spooklicious Creative Writing Lesson For You! One of my Monster Moon co-authors, Maria Toth, called me at 10:30 Thursday night. She was so excited, I thought maybe she’d just signed a six-figure contract! Nope (not yet anyway)! She was playing around with YouTube and found a video from two years ago when she and co-author Kathy Sant starred in a Homework Hotline episode on KLCS – a PBS TV station affiliate, Los Angeles. The half-hour program is split up into three parts. Bookmark this post so you can find it when you need it. 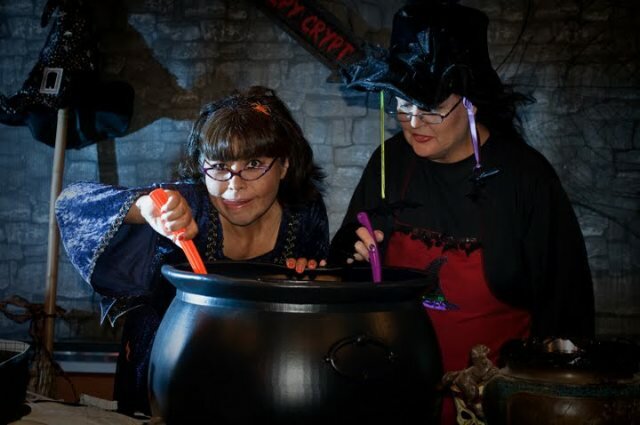 Kids love the silly humor and cool Halloween props we lugged onto the set, like Fangs, the vampire bat in a bird cage, and a bubbling cauldron stewing with the elements of suspense. In case you’re wondering where yours truly was (bawk! bawk! bawk! ), I was way too chicken to be on TV, so I was happy as the cue card girl. Even doing that made me nervous! At times, my hands shook as I hurried to switch to the next card. I could have read an excerpt from our first Monster Moon book, CURSE AT ZALA MANOR (more info in the sidebar), but I was afraid I’d get stage fright, so we asked my daughter to read it, and she did a super job. We even got her husband to play the parts of Dr. Frankenstein and Dracula! Here I am with the poster board cue cards I made! I’m giving a thumbs up to my Zombuddies, Kathy and Maria. Yikes! But Kathy and Maria kept their cool and did an amazing job. A lot of work went into writing, tweaking, and practicing the script, plus gathering all the props for the set. Looking back on the videos two years later, Maria laughed and said, “Oh, my gosh, it was such a SCREAM!” We were all loopy from pushing to get everything done on time for two 30-minute episodes. Here I am goofing off with MC (Main Character – the dummy under the blanket). MC saved the spot for the werewolf to switch places during the last few minutes of the segment. Toward the end of the show, the werewolf sat up and made his appearance. There’s another Homework Hotline episode we did titled, “Brainstorming in the Rainstorm,” but we haven’t found it on YouTube yet. If we find it, I’ll post it in case anyone wants to use it for another creative writing lesson. So, how about you? Would you be gutsy enough to do something like this on TV, or would you rather help out behind the scenes and hold up cue cards like I did? This entry was posted in Authorly Stuff, BBH McChiller, Curse at Zala Manor, Secret of Haunted Bog and tagged Halloween, Kidlit, Mary Shelley, Suspense, Teachers, Writing Lesson. Bookmark the permalink. 30 Responses to How Do You Cook Up Suspense? LOL…I'm with you. I'd be nervous to even hold the cards. That's awesome though! Perfect lesson for Halloween time, great stuff, Lynn! I'd be so nervous, I'd be practicing weeks before. I think ventures like these act as confidence boosters so I might be afraid, but game. OOh, I'd love to try something like this on TV! Btw I liked the music in these scenes – quite mysterious! Old Kitty – I hope you enjoy the videos! Thanks!L.G. – If you're a ham when forced to do something, then I think you would have had a blast doing this. Good for you stepping up to challenges!Paige – I'm so glad you can relate to the pressure of holding cue cards! It sounds so trivial, but they were really depending on me!Catherine – Thank you. Yes, it is perfect that Maria found these old clips just in time for Halloween!J.L. – I'm the same way about having to practice weeks in advance and memorizing the lines. I always study before I take a test, too! Haha! Good for you being game to do something like this. I think that's great. Munir – How exciting that you niece just had a baby girl! Congratulations, Great-auntie Munir!Talei – Cool, so glad you liked the mysterious music. I hope you do get to do something like this sometime. Jess – I know what you mean because I did wonder how I would have done, but I couldn't chance having a panic attack and screwing up the whole thing. It turned out that I made the right decision since I was shaky just holding the cue cards! Haha! This is so neat! I'm glad you shared all the clips. I don't blame you for hanging in the background. I can't even Skype without getting red in the face. I'm not a camera girl.Thanks again for the smile. Your pics are always the best. E.R. – I think I'd be nervous doing Skype, too, except for an author visit with kids. I love talking to kids. Thanks for the compliment on the pics. I'm glad you enjoy them!Susan – I think it's great that you're comfortable speaking to a crowd and being in front of the camera. I think speaking off the cuff is really tough, too. My mind draws a blank! Actually, I'm discovering that I like performing, but in my own way, making silly YouTube videos and being able to edit out the mistakes. I never could have foreseen that I'd be doing something like that and I wish I'd been involved in theater when I was younger, but I had no desire to back then! That is fantastic! I'm a behind the scenes person myself or an anonymous extra in the chorus line. I can't even stand to have my picture taken. But I'd love to be behind the scenes. That would totally cool! What an amazing experience. How brilliant. And despite the hard work and nerves it looks like it was lots of fun. Cue Cards! *Holds up hand to volunteer! 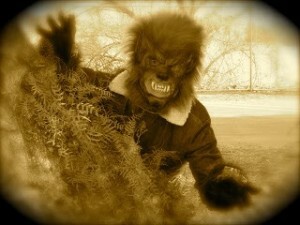 * Of course, if I could borrow that werewolf mask that would make a difference. That would bring out my wolfie side and make me bold enough to take on the TV camera.Great fun. I'm envious of having writing buddies that are willing to do this stuff together. Okay! This is so dang awesomely delicious. I was hoping the cue card girl would do something else. Something star like. (Cuz you a star in my book.) But alas. Maybe next time. You rock you little "like to have Halloween type fun" gal.I'z wants me a brew pot like that. Huggin' you and lovin' you. Bish – You and I seem to have a lot in common!J.A. – That's awesome that you have an outgoing personality and feel comfortable in front of the camera. Nancy – Yes, it was really cool being behind the scenes and seeing what it's like on a set. It was way bigger than I imagined.Lynda – Thank you! Yes, it really was a lot of fun, especially looking back on it, after we had a chance to catch our breath! Talli – Yep, I can see you doing something like this, after seeing you rock in that videoclip, all dressed up like Marilyn Monroe! Lee – You did an amazing job in that TV interview, but I agree with you about wearing a mask (or even makeup to hide behind) and that does make people less inhibited. I'd love to see your wolfie side come out! LOL.Amy – Thank you for commenting and sharing the post on your FB! Love you!Robyn – That's what I love about you, your upbeat, loving personality. Anytime I need a peptalk, I'm coming to you, my friend! LOL! Both. I just want to be part of the action. I'm not a great TV personality. I think I'm better behind the scenes. But I can do some stuff on camera. Rehearsed or ad-libbed. But caution, I may say something spontaneous that is not part of the script LOL! Great news kiddo ! Congratulations to you, the new parents and both the families. Do the new parents live close to you. My neice lives in Florida and I am not so sure when I will see the baby or the parent. My brother sends pictures though. She is cute as a button. Nutschell – Aw, thank you! Stephen – You would have done fine with this script, and ad libbing would have been okay, too. Behind the scenes if also fun!Munir – No, my niece doesn't live very close, about four hours away, so I don't know when I'll get to see the baby, but you're much farther away from your niece. Like you, I'll get to see plenty of pictures of the baby in the meantime! Thanks for stopping by! You're way braver than me! I think you're super-creative. OMG how fun is that? I would LOVE to do something like that. Maybe I can talk my writer buddies into it. He he he. I think these clips would be perfect to show my kids! And just the right time of year (with Halloween coming up). What a blast!!! Enjoying your blog. Following! And I'll have to show my "Peanut" the Halloween videos this weekend.